Most big routers come with a 30mm guide bush as standard. 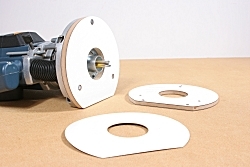 One reason for this is that one of the common guide bush applications for big routers is mitring kitchen worktops, for which the specified guide bush diameter is 30mm. If your 30mm guide bush is too long for the thickness of the worktop jig, and you don’t want to cut it back, you can make a false base thick enough to give clearance in the jig. Alternatively, you can make a shim from plastic laminate and tape it to your router base to give the required clearance. The same technique can be used with other guide bush applications. I’ve often used it with guide bushes for dovetail jigs.